The Library Resource Center has two locations, Primary and Secondary. Staffed by very helpful people, the two libraries are places for reading, studying, and researching. In Primary children visit the library regularly, once a week, to borrow books, read or listen to a story. Our extensive collection for ages 4-11 can be searched here. 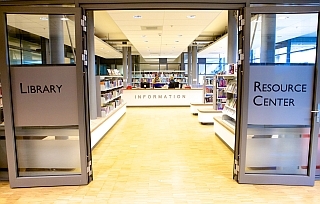 The Secondary Library’s collection, which can be searched via this link, is mainly comprised of books, but also includes educational web services and subscriptions, ebooks, and videos. Students visit the library either with their classes and teachers or on their own during their free time. They can make use of the laptops and iPads, as well as the extensive print collection of fiction, non-fiction and magazine collections, which supports the Middle Years Programme (MYP) and Diploma Programme (DP) curricula. Students can get help with their research and homework, or find novels to read for leisure purposes. In addition, the Head Librarian conducts instruction on research methods for all students. Parent and student volunteers are welcome! Donations of books or other materials are also appreciated. Please call the librarian to make an appointment first.